I have had an interest in seeing a Bighorn Sheep for a long time, While in Yellowstone NP, my dream came true. 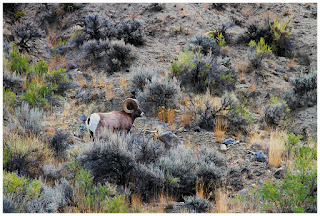 While driving through the park I noticed a full grown male Mountain Bighorn Sheep slowly walking across a steep hill face. I truly could not have been more fortunate to see such an animal in such a location. I was handed a perfect moment, now it was up to me to capture the animal in a way that would flatter its size, shape, powerful will and magnificent pose. I decided to keep a bit of distance and compose in a way that highlighted the landscape he was walking across. The time of the year was just about right, the bushes foliage was starting to lose it vibrancy, but to me this was the special element to the scene. I think the subtle pastel hues complemented the coat of the Bighorn Sheep. Technical details: Canon 7D, Canon 24-105L lens (@105mm), ISO 200, F/5.6, 1/30th.